The world famous Sesame Street Muppets have arrived in Fiji. They’re hoping to put a smile on the faces of children whose schools and villages have been devastated by Tropical Cyclone Winston. Today, Elmo and Grover will meet children who are learning in makeshift tents, as their schools are rebuilt. While it’s important to ensure they’re entertained and escape for a while by laughing along with furry monsters, positive mental health messages and physical health and safety education is top priority for Red Cross. I met with communications delegate for the International Federation of Red Cross and Red Crescent Societies (IFRC) Corinne Ambler and her colleague Marica Kepa, who is the Fiji Red Cross health coordinator based in Suva. Marica told me some of the children in villages are extremely scared of wind and rain. “Even a short wind gust can force frightened children to run from the tents and outside in a confused panic.” She hopes the Muppets will be able to teach them that this sort of weather is all part of normal life in Fiji and not to be scared. The power of Cyclone Winston was so great that school roofs and walls were ripped off. Therefore, children are learning in a foreign environment, which places additional stress on them. 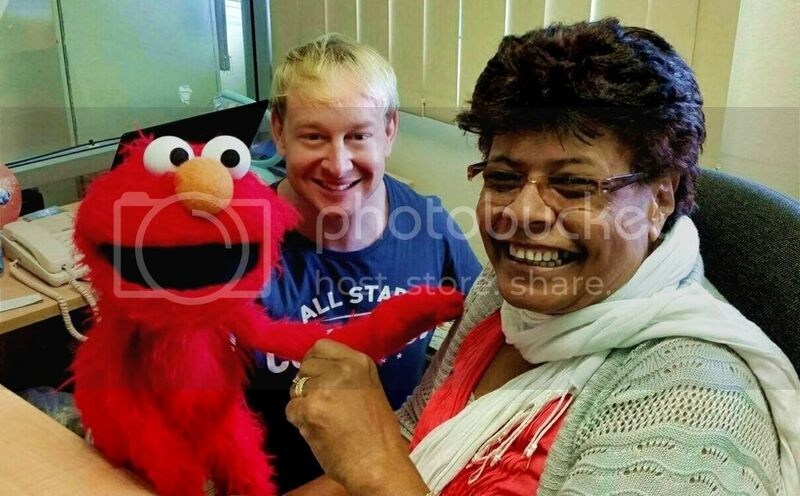 During our meeting, Marica met Elmo and Grover and couldn’t stop laughing. With a great big beaming smile, she said “They’re awesome. If I can be affected by them this way, imagine what the children will be like.” Today our first visit takes us to Vunikavikaloa, a small settlement on the northern coasts of the Ra Province in Viti Levu, Fiji. Chris Lynch has travelled to Fiji supported by Fiji Airways.